For this month's "Maps of the Month" featurette, I wish to draw your attention to Zeric's Castlevania: Rondo Of Blood (J) (TG16) maps. Akumajō Dracula X - Chi no Rondo, as it was originally known on the PC Engine (the Japanese version of the TurboGrafx 16) is one of the underrated Castlevania games. However, it directly influenced Castlevania: Dracula X (Super NES) and the incredible Castlevania: Symphony Of The Night (PSX), and many sprites from this game are reused in the GBA and DS games. The game was finally released outside of Japan in 2007, both as a remake and also in its original form under Castlevania: The Dracula X Chronicles (PSP), whereby the English name "Castlevania: Rondo Of Blood" was made official. When originally released, it was certainly one of the best-looking games of its time. The last time Zeric received the honour of "Mapmaker of the Month" was in December 2007 for Mega Man 8, the first time a PlayStation game was a part of this monthly feature. Zeric adds two more firsts with this month's, by having the first TurboGrafx 16 game and the first (formerly) Japanese-only game to be recognized here. Congratulations! 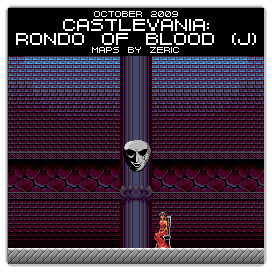 So to recognize the effort put into mapping this Japanese TurboGrafx 16 classic, Zeric's Castlevania: Rondo Of Blood (J) maps will be known as VGMaps.com's Maps of the Month for October 2009. The game looks good. I never played it before, maybe I will have to find a TG16 emulator and try it out.